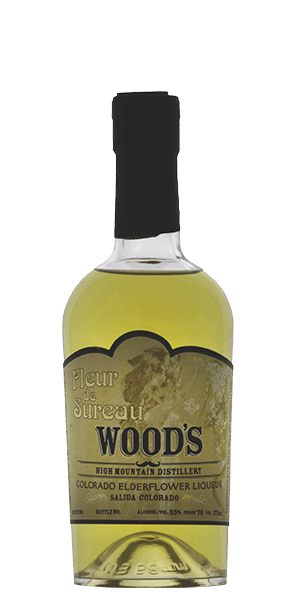 Woods High Mountain Fleur de Sureau Elderflower Liqueur is made like fine Cognac with a whole lot of attention to detail and love if you ask us. So since we are on the topic, let’s talk about that Fleur de Sureau Elderflower Liqueur of theirs, shall we? You may have noticed that Elderflowers are all the rage these days. They are the tiny, wonderfully aromatic flowers that gather in snowball-like clusters each spring on the Eder plant. And because alcohol infusions and pure, simple syrups make everything better, you add them in to make a liqueur and life is really, really good. Most producers of Elderflower Liqueur use neutral grain spirits and white sugar for their liqueurs. But Woods High Mountain Fleur de Sureau Elderflower Liqueur is made like a fine Cognac. They distill sweet Muscat and Riesling wines for their base, infuse it with local, wild Elderflowers, and then balance the sweetness with raspberry blossom honey instead of sugar. That there’s a whole lot of attention to detail and love if you ask us. We say sip it neat or mix 50/50 with your favorite Champaign … you WILL NOT be sorry you did! What does Wood's High Mountain Fleur de Sureau Elderflower Liqueur taste like? The Flavor Spiral™ shows the most common flavors that you'll taste in Wood's High Mountain Fleur de Sureau Elderflower Liqueur and gives you a chance to have a taste of it before actually tasting it.